An exciting and entertaining musical period piece, this film works in nearly all departments, including the drama. A fascinating movie, this film is about the rise of a group that is filled with behind the scenes drama. There’s one player who causes it all, a man named Curtis (Jamie Foxx) who is the one that gives the girls their big break. He’s also the one who makes the decisions to upset the balance of the group and turn the girls against each other. There are some wonderful songs here, and an even better story. The only problem is that sometimes the movie overdoes it with the music and it’s often at the stories expense. There are a few too many songs, in areas where we could have used a little more story. Other than that, however, the movie is fantastic. Dreamgirls is a fun and fascinating movie. It’s the story of a group of girls who pretty much go from rags to riches. These girls always had the talent, but they slowly get recognized, making it bigger and bigger, and dealing with a couple of obstacles along the way. The most interesting trouble the girls get into all happens within the group, which is not what you would expect. Between the back-stabbing, betraying, and corruption, this movie has a lot going on behind the scene, and the longer the movie goes on, the more of it starts coming to the surface. At the start of the film we are at a sort of talent show competition at a night club, on the stage, in front of a big crowd. The three girls are Deena (Beyonce Knowles), Effie (Jennifer Hudson), and Lorrell. They have grown up together and are very small time. Deena even talks a lot about her grandmother, and how she can’t stay out too late because the guardian wants her home by a certain time. They go on stage and perform, with Effie as their lead singer, and it’s pretty good. But there are a lot of musical performances going on here, and it’s a bit overwhelming. What is interesting, however, is that there is a music producer, Curtis (Jamie Foxx) hanging out behind the stage, and he pays to have the girls not win the competition. Also hanging out by the stage that night is a man named Jimmy Early (Eddie Murphy), and he’s got a little problem. The girls who are his backup singers have just run out on him, quitting the job, because he started touching them inappropriately. There’s only one problem. These girls want to sing and dance themselves, and don’t want to be stuck doing backup. That’s how Effie feels, since she the star of the show with the Dreamettes, and Curtis convinces her that this will only be temporary. Meanwhile, Effie’s brother, C.C., who wrote the songs for the girls, is now starting to write songs for Jimmy Early. Curtis represents the girls, but he does not represent Early. For Early, he has a man named Marty (Danny Glover), who has been with him since day one, and has always had his back. Only Curtis represents something new, and he promises Jimmy the world, to the point where Jimmy has to make a decision. It’s not Curtis or Marty, but more like if Curtis stays and represents Jimmy in any way, than Marty will leave. And that’s exactly what happens. This is the first sign of trouble. Curtis is up to something. He has a Cadillac dealership, which has been his established business while he produces music on the side. Only now, he’s ready to start devoting more of his time to the producing. Curtis sells his dealership, sells all the cars in the lot, and uses the money to get the group much more work. Only he has some major changes to make. First, Jimmy and the girls will no longer be on stage together. He separates them into two different acts that are both under his label. Next, Curtis revamps the Dreamettes, now calling them the Dream and replacing Effie as the lead singer with Deena. This is a major issue for the group because Effie has always been the lead, and now that they are finally going to get their big break, she is being replaced. Aside from that, Effie and Curtis have been a romantic item for a while now. Him replacing her without even speaking to her about it first feels like complete back-stabbing. Effie accuses Deena and Curtis of sleeping with each other, sings a few songs out of anger, and walks out. As it happens, Effie is pregnant with Curtis’ baby. Only she doesn’t tell him. Instead, she comes back and continues to sing with the girls, but can’t help herself from stealing the thunder and being excessively loud. She walks out again. This time it’s for much longer. When she finally comes back, the group has found a replacement for her. The performance hall that had hired the girls for New Years Eve demanded three girls, and not two, and so Effie had to be replaced. This time when she leaves, she does not come back. Her brother, C.C., however, does stay. There’s a good amount of story here. It’s all very compelling, as Curtis becomes a mogul with Deena as his queen. The story behind the movie is the best thing about this film. The only problem is that it is constantly sidetracked by the music. The movie is over two hours long, and that is in partially because of how many songs there are. Now, most of the music is great, but there are also a good amount of songs that just feel like filler and could have been cut. Considering that the story is the best part about this movie, it would have been nice to get a little more of it.The movie ends up often feeling like a highlight reel that doesn’t show us the one-on-one conversations that must also be happening. Effie never confronts Curtis in private, for example. And there is no scene of her brother taking Effie aside and talking to her about what is happening. These things feel missed. This movie is much more about the group dynamic than it is about the individual. Even the scene where Jimmy Early has his new record rejected by Curtis is placed in a group setting with lots of characters sitting around on the couch. Some of the music definitely could have been cut to add a little more depth to the story, but even still, the movie does a nice job of giving us real characters and taking us down their paths. I like that Early, for example, doesn’t disappear from the story after he and the Dreams split up. Eddie Murphy gives a powerhouse performance here, showing that he’s still got all the talent and charm. And Foxx makes an excellent villain. This is a very good, dramatic, and well-made movie. Even the style and atmoshpere are fantastic, as put together by Broadway director Bill Condon. 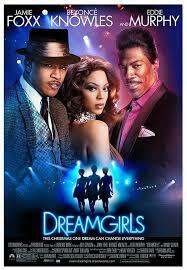 Dreamgirls is a solid success of a film.